WOW! "Red Fish Blue Fish” is a spacious, tasteful home with a private pool at the quiet north end and close to the beach….what more could you ask? Located on a corner lot makes an easy walk to the beach access. "Red Fish Blue Fish” has room for everyone and the layout offers plenty of privacy. Ample decking around the pool with lots of space to spread out! You will find a cabana bath convenient to the pool or for returning from the beach. Beautifully maintained lawn has a separate fenced yard beside the fenced pool so you can watch the little ones with a little less stress. The kitchen has two pantries for storage and most important is the dining table that seats 12. An additional table seats 4. A screened porch off the dining area offers ocean breezes in the evening and the deck overlooking the private pool is a great place to congregate after a long day at the beach. Everyone will love the private pool with plenty of deck room for the whole family. Top-Level: Great Room with 52 inch LCD TV, Kitchen with Bar seats 4, 2 Dishwashers, Dining Table seats 14, second Table seats 4, Deck Access, Den with LCD TV and Screened Porch, Half Bathroom Mid-Level: King Master with LCD TV, Soaking Tub, and Deck Access; Queen Bedroom with LCD TV; Bedroom with 2 Bunk Beds; Hall Bathroom, Laundry with Washer/Dryer. Ground-Level: King Bedroom with Queen Futon and TV, and Deck Access to Poolside Patio; Queen Bedroom with LCD TV; Bedroom with 2 Twins and LCD TV; Hall Bathroom, Cabana Bath located at rear garage for easy access from Private Pool. 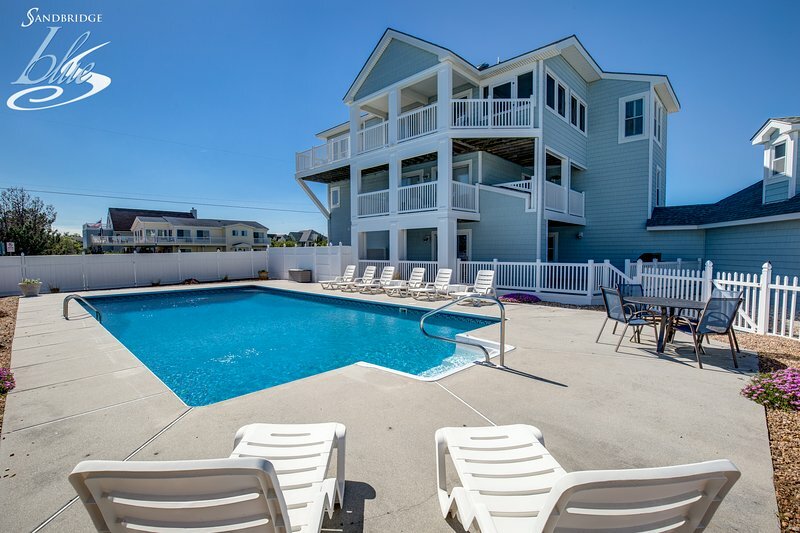 Extras: Private Pool (40 x 20), Wireless Internet Access, DVD player, 2 Dishwashers, Gas Grill, Screened Porch, No Smoking, PETS NOT ALLOWED, Parking: 6 Cars, Distance to the Beach: 558 ft. Additional amenity details: Private pools are open from May 3, 2019 until October 6, 2019. This property is not equipped for pool heat. Pool heat is not an option for this property. All Sandbridge Blue properties provide bed linens, bath towels, beds made prior to your arrival, and a starter supply of: toilet paper, bathroom soap, paper towels, and dishwater detergent.